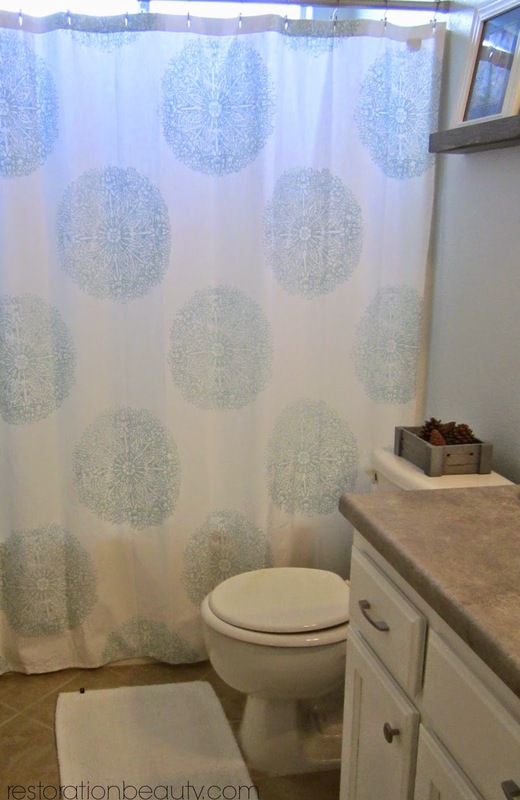 Today I though it would be fun to add our guest bathroom to the 'Our Home' page. 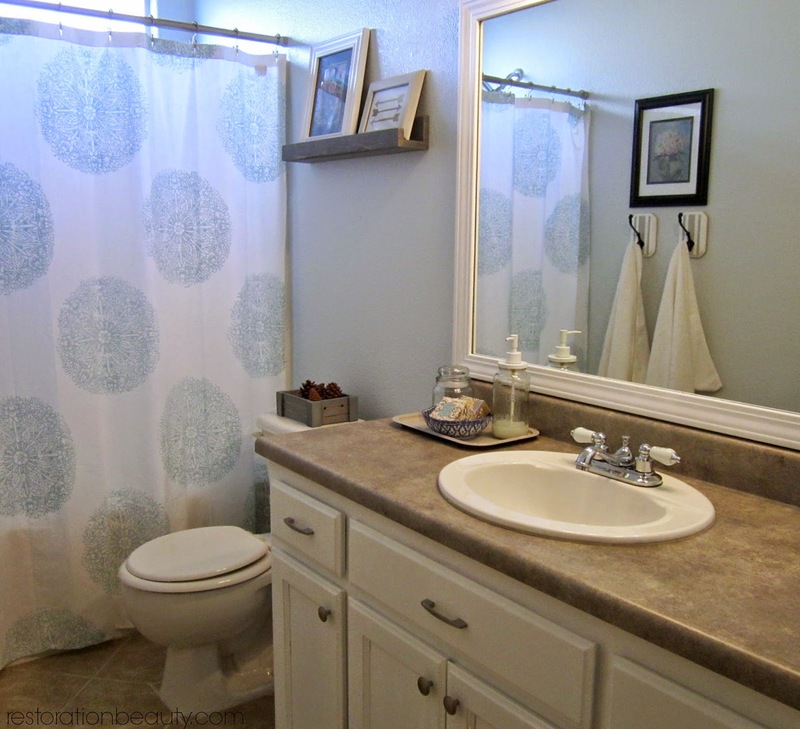 After all, it's a space that we completely transformed from builder grade to a guest bathroom that is more inviting and appealing....one DIY project at a time! 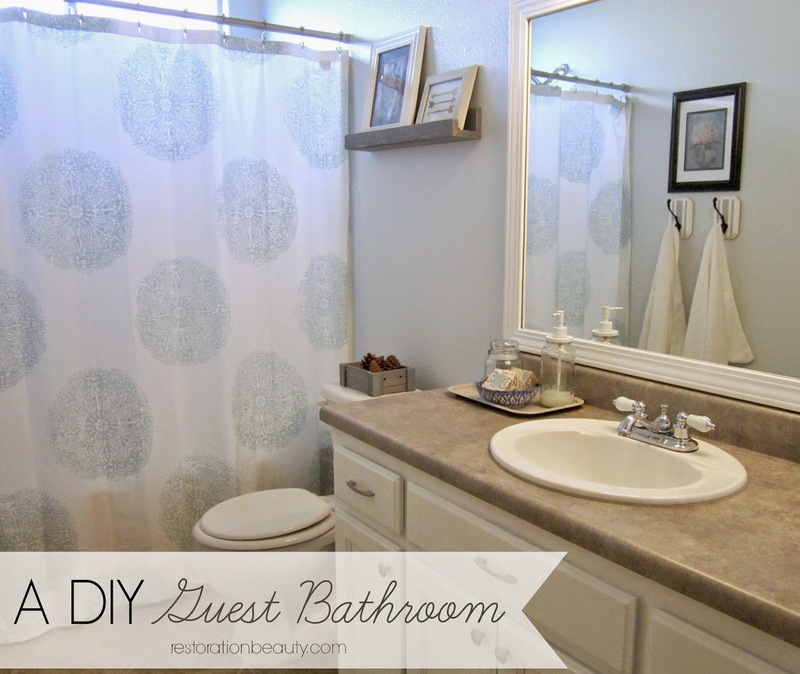 During this guest bathroom tour, I will be including links to all of the DIY projects that have transformed this once drab guest bathroom to a lighter and fresher one with more character. The only thing missing is a before picture. 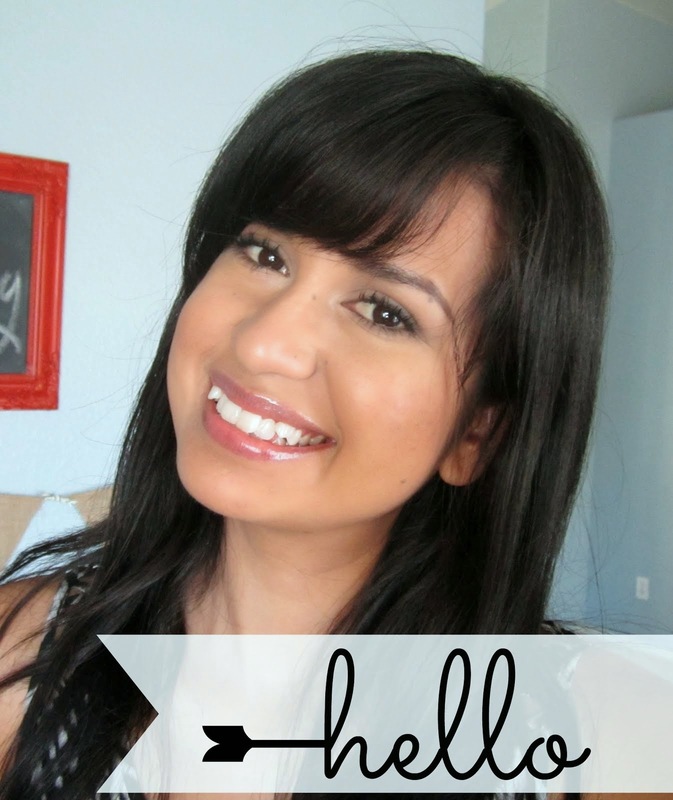 I started this guest bath makeover way before my blogging days and had no intention of recording it's ugliness. But I'm sure you'll forgive me for that. And like everything else in this home, there are still a few tweaks I plan on making (eventually) but I hate waiting for a space to be "perfect" because we hop around spaces so much around here that it would take forever! note: some of the projects were done in my pre-blogging days (or didn't make it on the blog) but will still be mentioned during the tour. 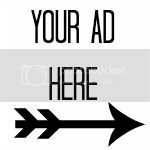 There's nothing DIY about my shower curtain, however you can checkout the old shower curtain, Floor to Ceiling Drop Cloth Shower Curtain for your DIY enjoyment! I recently changed it to this one from Target because I fell in love with it and had to bring it home with me. 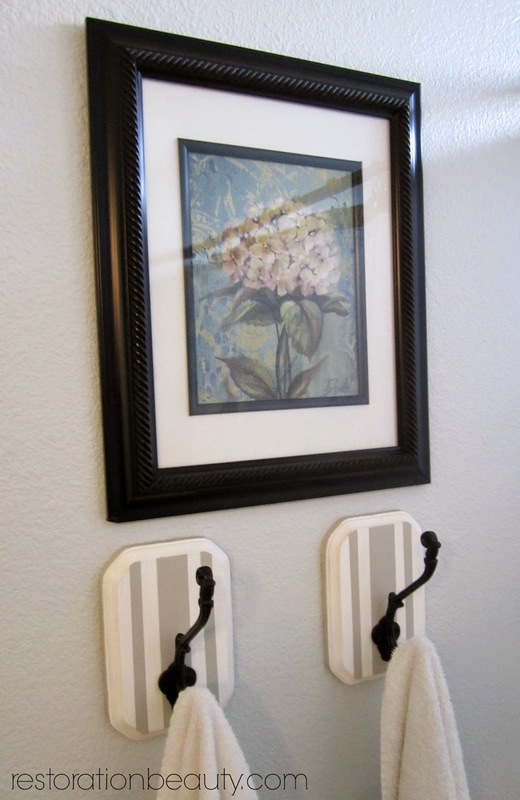 These Easy to Make Towel Hooks are what gave this bathroom some desperately needed character! Goodbye standard towel rack. I don't miss ya! Never mind that. You should have seen the ugly eyesore of builder grade lighting that this pretty satin nickle one replaced! 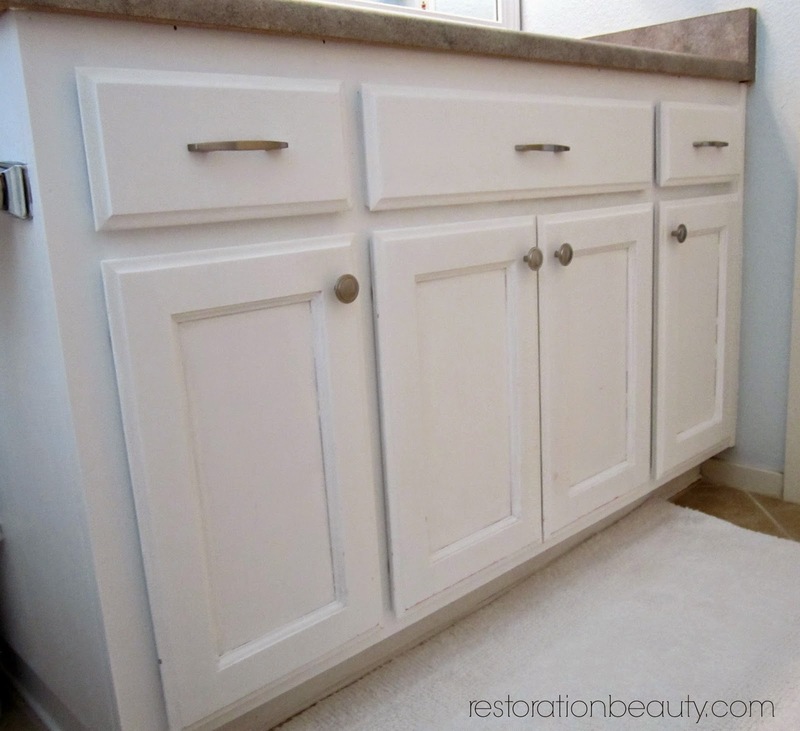 Painting Bathroom Cabinets requires time and patience but it's so worth it! In a few days I rid myself of the builder grade oak cabinets I dreaded and welcomed my white cabinets....a breath of fresh air for such a small bathroom. 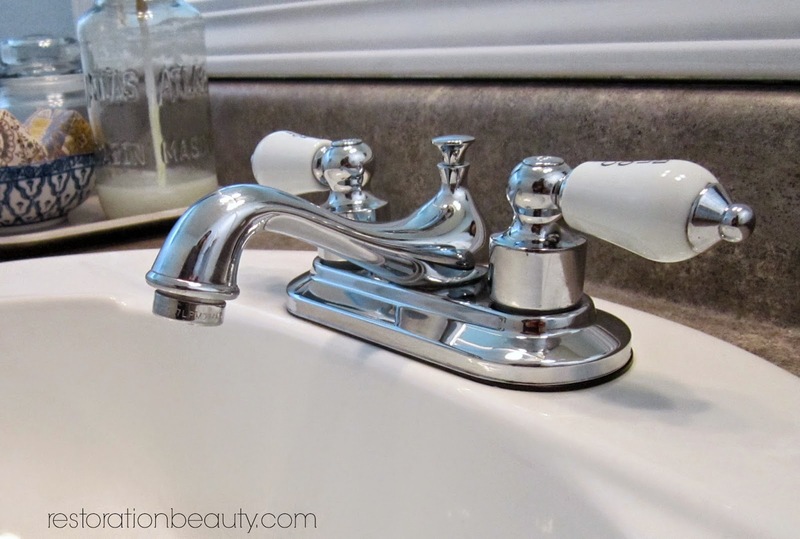 And I had to add a touch of French country with this faucet! Trust me. The old one wasn't pretty. Not even a little bit. Here's a mini version of my towel hooks. I though it would be a nice way to keep the hand towel off the counter. 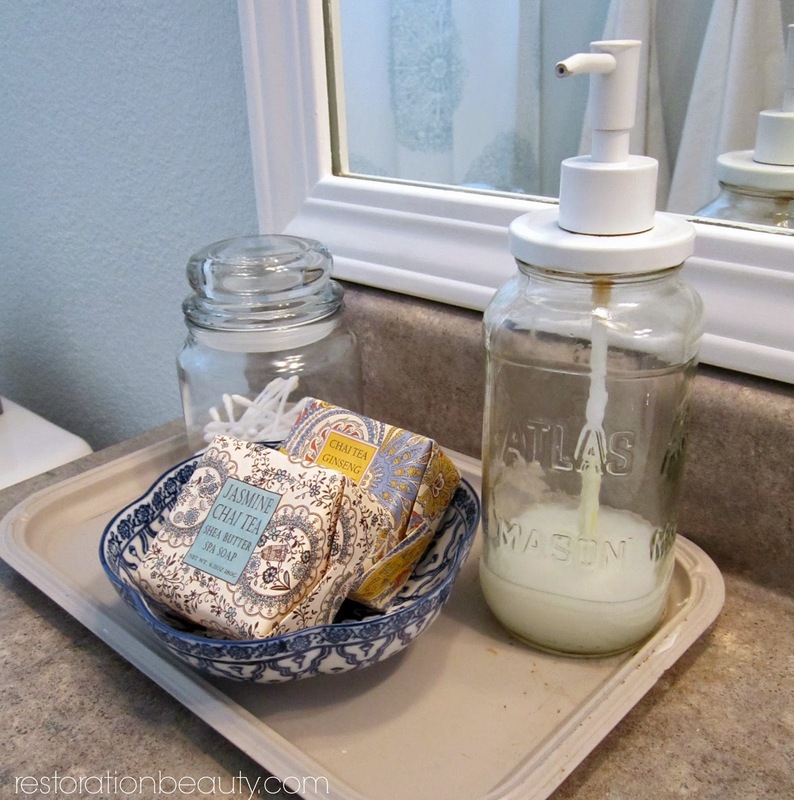 Mason Jar Soap Dispenser. Cute. Easy. One of a kind. Need I say more? This ledge is a smaller version of my $10 Gallery Wall Ledge and I stained it gray instead of painting white like the ones in my living room. 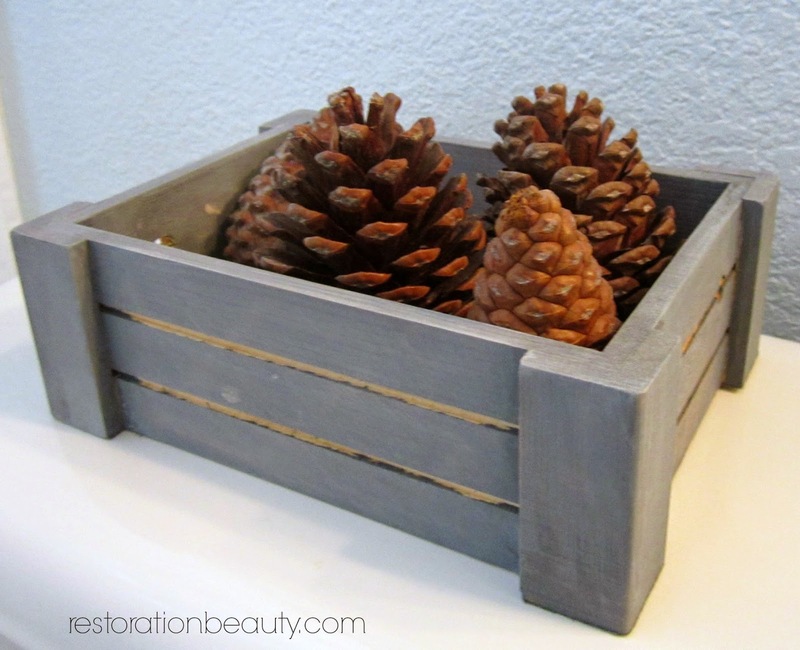 I bought this wooden box from Hobby Lobby and stained it with the same gray stain as the ledge. It makes for the perfect above toilet decor. So that concludes my guest bathroom tour! I hope you all enjoyed it and got some ideas along the way! I think you've done such a great job of transforming your bathroom! 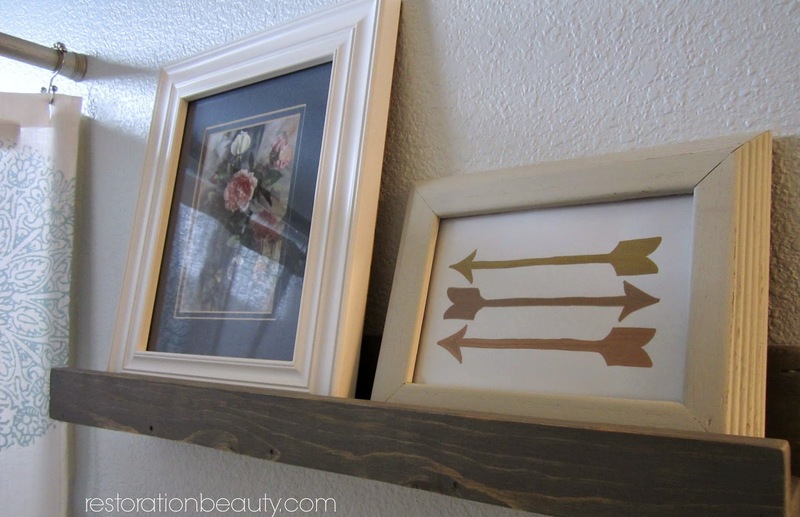 You've added your own personal touches and made it unique and so pretty! I love that shower curtain too and can see why it had to come home with you! 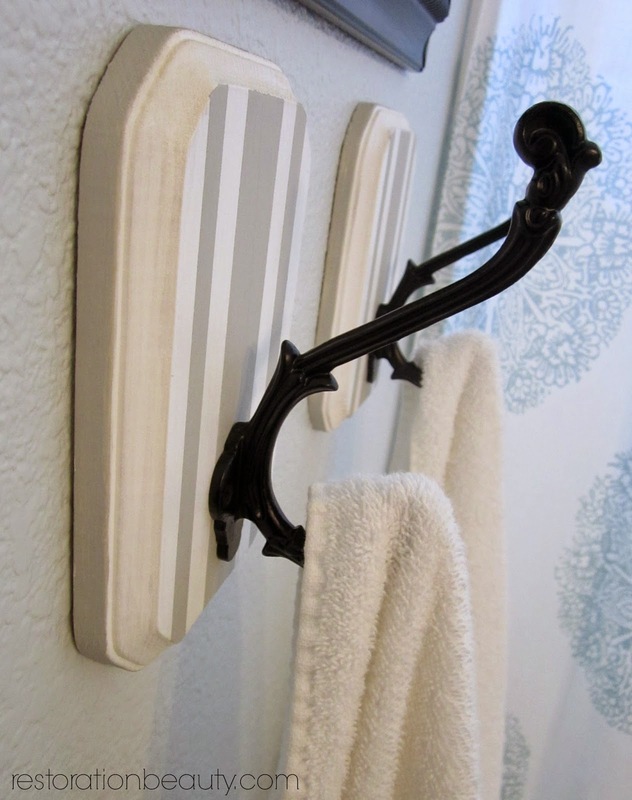 :) I also really like your custom towel hooks. It's amazing what a difference the framed mirror, new faucet, lighting and painted cabinets make! It's like a whole new bathroom! Thanks sweet friend!! You should of seen the before...totally hideous! Beautiful! We're in the process of adding onto our house. When that's complete, we'll actually have a designated guest bathroom (rather than one guests need to share with the kids!). I can't wait. Your bathroom is very peaceful and beautiful. Great work. 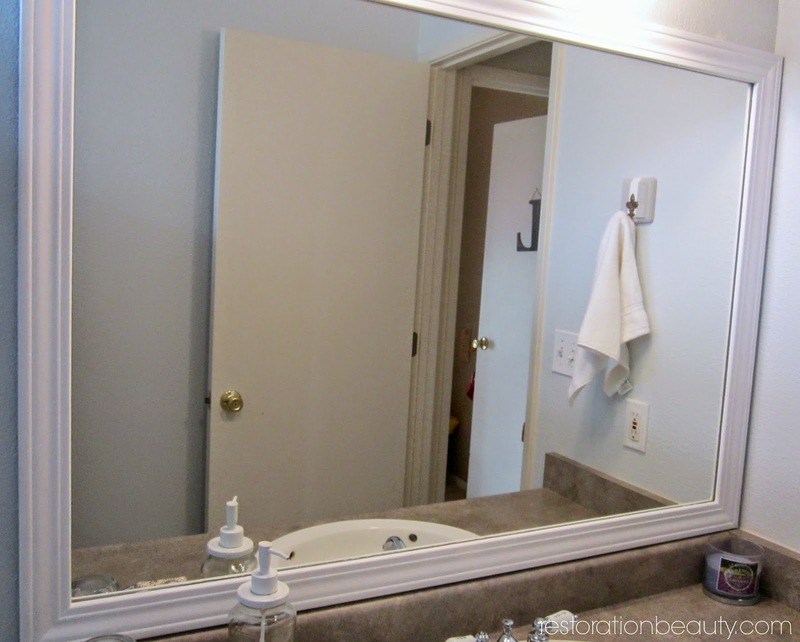 You're inspiring me to do a makeover of my bathroom! My kids bathroom needs some TLC! 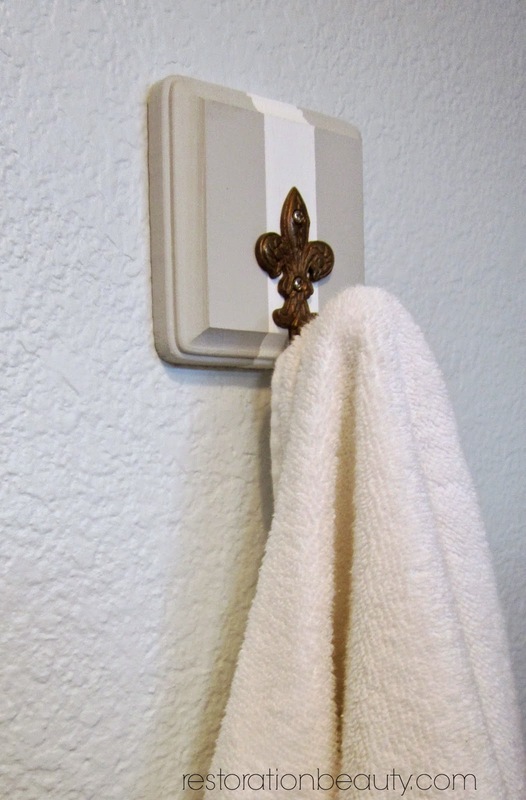 Your towel hook idea is great--pinning it! It looks really beautiful, like a breath of fresh air! My main bathroom is the next thing on my redo list for my home. Thank you, Lauren! You're going to have so much fun with your new bathroom! I'm so happy to hear this inspired you, Carrie!! 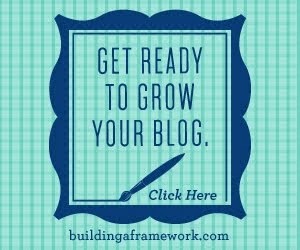 And thanks so much for pinning! Thanks Angela! 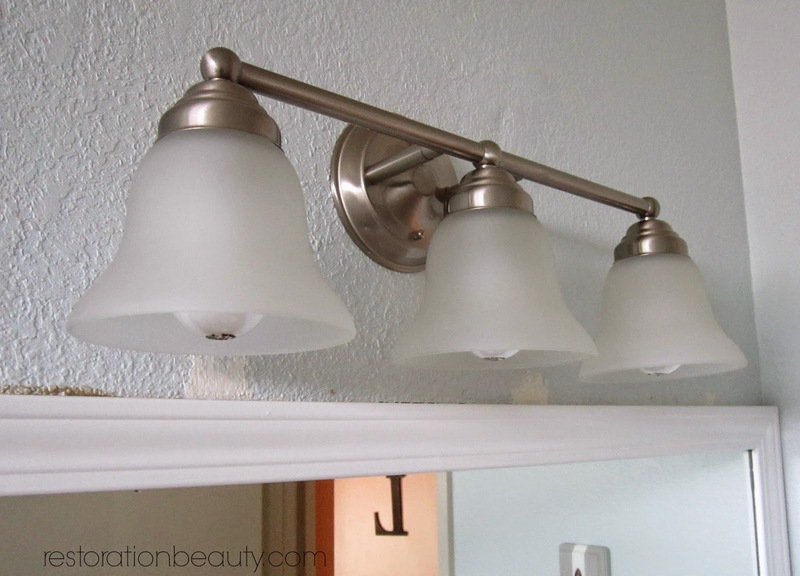 I really like those light fixtures- definitely prettier than the ugly ones that were there before! oh WOW!!! Can I have your guest bathroom as my bathroom? Looks beautiful Selene! !